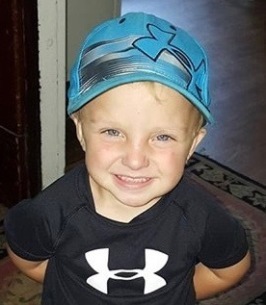 Toby Asher William Moore, 2 years of Hillsboro, passed away on Sunday September 16, 2018. He was born in Hillsboro on August 18, 2016, the son of Josh and April (Ferrell) Moore. Toby is preceded in death by his uncle, Dustin Ferrell, paternal great grandpa, James Moore, maternal great grandma, Thelma Ferrell and two uncles, Bill Moore and Bill William Moore. Toby enjoyed dancing with is mommy, playing in the dirt, paw patrol, horses, puppies, saying the word No, being outside and drinking black coffee. Besides his parents, Toby is survived by his three big brothers, Todd, Trenton and Tyler Moore, big sister Trinity Moore, maternal grandparents, Gary and Melissa Ferrell of Hillsboro, paternal grandparents, Ed and Joyce Moore of Summerset and Beth and Will Swick of Zanesville, aunt and uncles, Mary and Paul Kelley of Beaver and Jesse Ferrell of Columbus, James and Cary Moore, great grandma, Minnie Moore of Summerset and several other aunts and uncles, cousins, family and friends. Funeral Services will be 11:00 AM Tuesday September 25, 2018 at the Thompson Funeral Home. Burial will follow at the Vernon Cemetery in Wheelersburg, Ohio. Friends may call from 6:00 PM to 8:00 PM Monday September 24, 2018 at the Thompson Funeral Home. To send flowers to the family of Toby Moore, please visit our Heartfelt Sympathies Store. We encourage you to share any memorable photos or stories about Toby. All tributes placed on and purchased through this memorial website will remain on in perpetuity for future generations. You all are in our thoughts and prayers. Your friends in Tennessee Love You Guys! Thinking of you, and sending prayers!!!! There are no words-such a sweet angel gone too soon. We are praying for you.